After backing off Kippure last week due to snow, stream and time issues ,I was pleased to head out again this Sunday with a pal to tackle the hill once again. 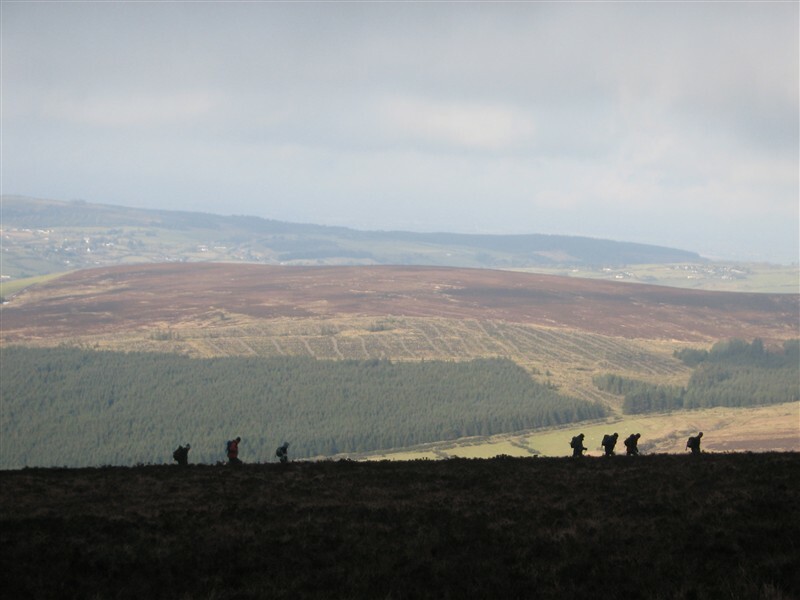 We planned to follow the route set out by Joss Lynam in his Best Irish Walks, although with the benefit of two cars we opted to take out the road section of the walk and save ourselves some time. After meeting in Woodstown we drove up past the Hellfire club and into thick cloud which was to stay with us for much of the day. As the road climbed the temperature dropped and patches of snow grew increasingly common until shortly after the Kippure access road we passed through an area where just two wheel tracks were cleared through the snow. The conditions suggested it was going to be an interesting day. After a bit of doubt over where to park the cars (Note: the Kippure Woods car park referenced in Lynam’s book appears to be permanently closed) we packed up and started through the woods along by the pretty Athdown Brook. Visibility dropped while the amount of snow we encountered rose as we reached the top of the woods and altered course to drop down towards our first hill, Seefin. 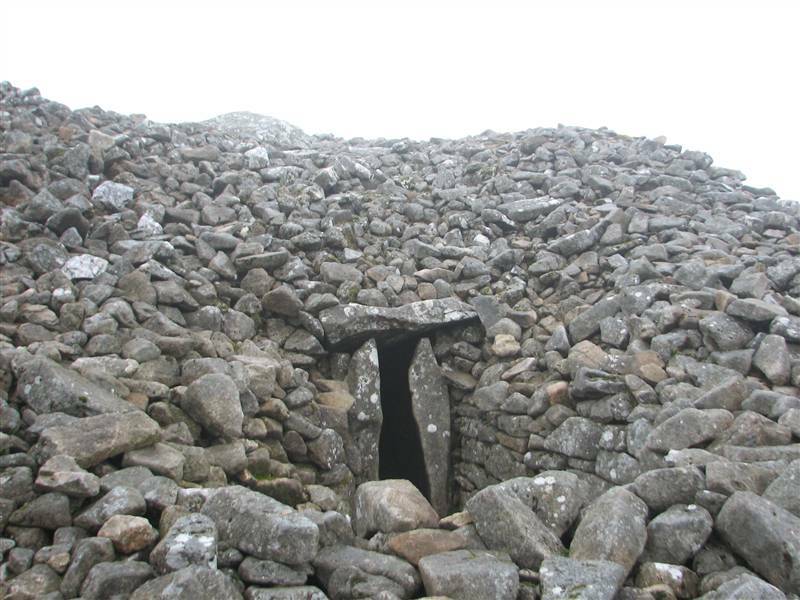 Seefin has fine views towards the west and south over the Blessington Lakes and hosts a fantastic megalithic tomb that we climbed down into for a look around. James crawled and wiggled through the narrow opening…picking up litter as he went. Who dumps sweet wrappers in a place like that? In any case, it’s brilliant to have such free access to an ancient site like this. On we went, back into the clouds and up the hill towards Seefingan. 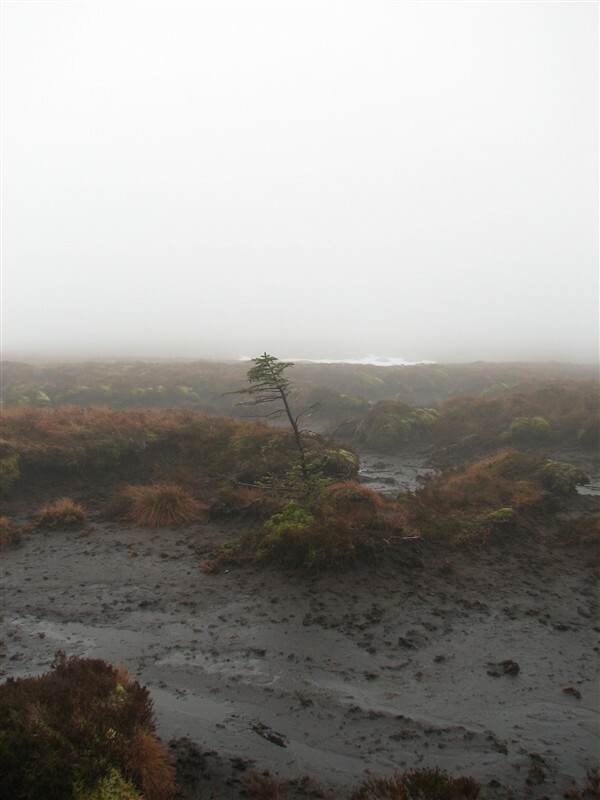 By the time we reached the summit visibility was down to about 30 feet so with map and compass we made our best estimate of a bearing on Kippure and started out into the ‘featureless bog’ that lies between the two tops. Come and help us Joss! Without being able to see Kippure up ahead, or more than 40 feet or so around us it was like moving through a bubble of bog and snow with only the pitch of the ground giving us an indication that we were on track. At one stage the cloud did clear slightly for a moment and we saw that we were actually off course by a couple of degrees. Thankfully this break saved us from going any further astray. A healthy dose of messing kept us going though, as sinking knee deep into bog and commando rolling across deep snow drifts is plain fun, and after an hour or so we finally slogged up to the top of Kippure….4 hours after leaving the car, about an hour behind schedule. Now we had to make another blind bearing of 220 degrees in order to reach the Liffey Bridge and James’s car. We had great fun running full pelt down a hugh snow field before some less enjoyable bog trotting past a couple of long dead deer before we got back tired by satisfied to the car. 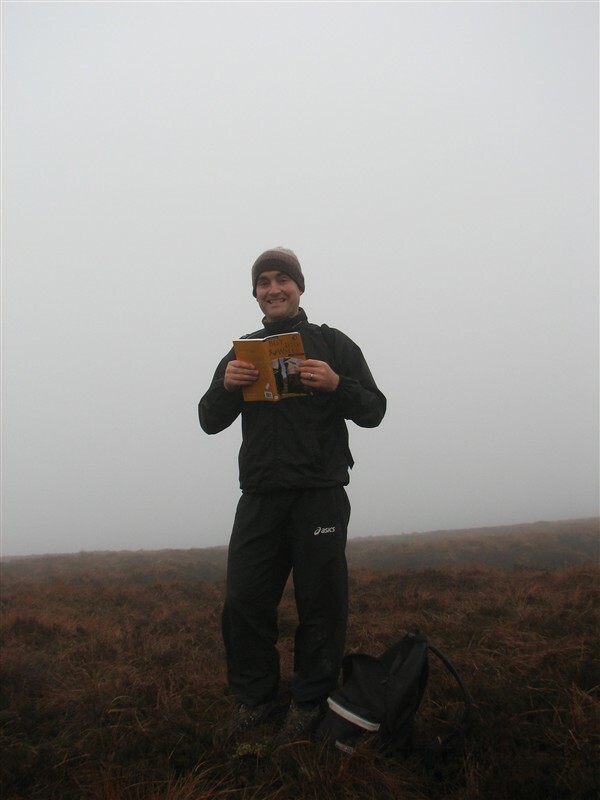 A great walk, and another county top completed. Well, we did Kippure this weekend. It was a lovely 14 degrees before we left and by the time we reached the parking area, it was absolutely freezing. Of course we were dressed for the tropics after a false sense of security due to our recent warm weather. Kids were a bit cranky to start but we did it all the same. Our youngest was carried most of the way, although had we have brought the buggy, the road would have been ok for it. We took the service road which was a bit mundane, but as usual when we reached the top, despite the gusty winds and the drizzle, we had a great sense of achievement. Then headed back down the 3.4km service road with the promise of ice cream and goodies to entice everyone along. Not one of the most pleasurable of walks but delighted to have another one done. Returned back to lower ground to again beautiful weather. Lesson learned – always keep a stash of extra clothes in the boot – just in case and bring some culinary bribes for the kids and the parents alike. Hi Niamh, yes it’s important to have warm clothes, even on the warmest days. The weather can change quickly, or you might just find yourself delayed outdoors for some reason. 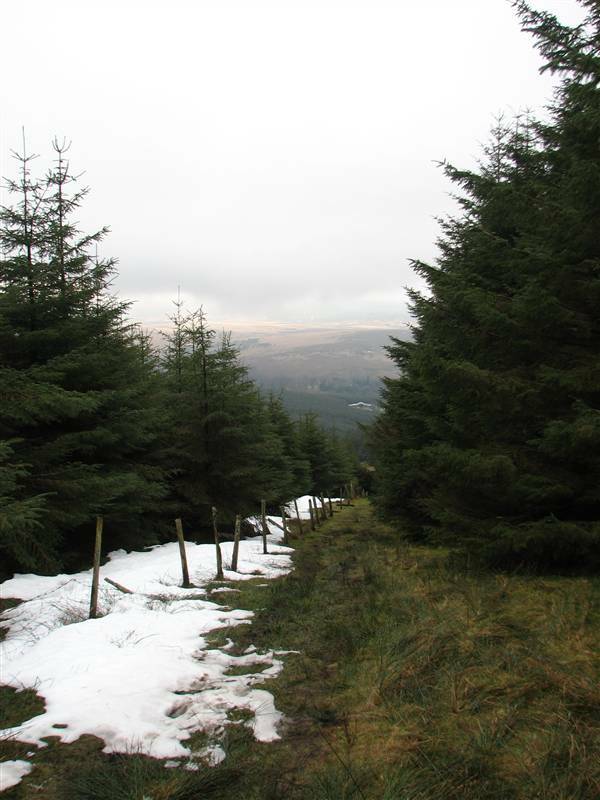 My pal and I had spits of snow in May last year when we walked Knockmealdown in Waterford, and wind so cold it hurt our teeth on Lugnaquilla a few days earlier. The road up to Kippure is not the most exciting…though I’ve always thought it would be great in snow.